Bill Reid, Ph.D. is a postdoctoral researcher in the laboratory of Dr. Alexander Franz in the Department of Veterinary Pathology at the University of Missouri, Columbia where is is studying mosquito/arbovirus interactions and the application of insect genetic technologies to the control or elimination of arbovirus transmission. In a recent PNAS publication by Buchman et al (2019), the authors report on the establishment and validation of transgenic Aedes aegypti containing a synthetic anti-ZIKV cassette, capable of conferring complete refractoriness to the virus. piggyBac transposon integrates into the genome of Ae. aegypti at TTAA sites. Each site can be influenced by the “position effect” of where the transposon is inserted, thus researchers test multiple lines to validate that the transgene is effective independently of position effect, or to identify the best insertion site. Image from addgene.org by Amar Singh and Mathew Goodwin from Transposagen. Aided by piggyBac transposon-mediated insertion (Figure 1), they generated four lines of Ae. aegypti expressing a polycistronic miRNA-like cassette containing eight synthetic miRNAs under control of the Carboxypeptidase A promoter. 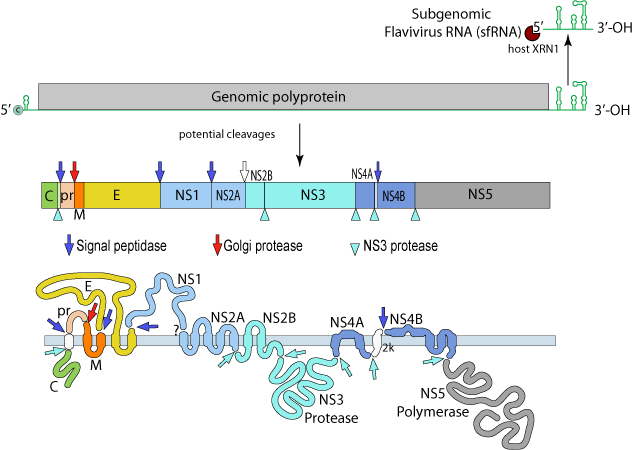 The expressed miRNAs targetted three structural, and three non-structural genes in ZIKV, including NS5, a highly conserved gene among ZIKV strains (Figure 2). Small miRNA profiling of the transgenic lines identified efficient expression and processing of the miRNAs. Figure 2. The genome of ZIKV consists of ~11kb of +ssRNA, including NS5, which encodes for a methyltransferase that a 5’ RNA cap, and an RNA-dependent RNA polymerase, which initiates the RNA synthesis. Image from viralzone.expasy.org. Challenge of the highest-expressing transgenic line with two divergent strains of ZIKV demonstrated complete ZIKV resistance for homozygous individuals and a strong reduction in heterozygous individuals. Modeling of ZIKV infection in both Vero cells and in Stat-/- mice demonstrated a significant decrease in midgut and carcass infection, and also a decrease in prevalence in saliva. The authors note that if the construct is linked to a gene drive system, it could be used to push the anti-ZIKV allele as homozygous through a population of Ae. aegypti, resulting in a population that is completely refractory to ZIKV.